With our PayorCRM, businesses like yours are equipped with a simple platform with a robust set of tools for acquiring payments from customers with ease. 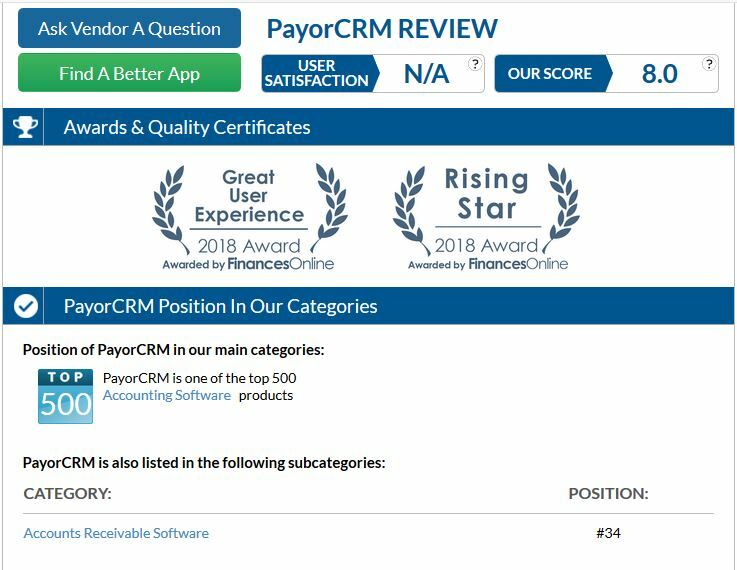 FinancesOnline came to this conclusion after they created a thorough review of our PayorCRM features, and they hailed our B2B Accounts Receivable Software with their esteemed Great User Experience and Rising Star awards for 2018. FinancesOnline’s Great User Experience award for best accounts receivable software acknowledges that our PayorCRM team was successful in designing an intuitive and user-friendly platform that users can fully maximize with minimal training. This industry award specifically highlights software systems that offer an incredibly pleasing user experience for facilitating your routine tasks in the workplace. Aside from our intuitive interface, the aforementioned industry award can be attributed to several features of PayorCRM. Among those highlighted in the review are our robust integration with the leading ERP and CRM platforms that “simplify and accelerate your processes” and easy management of invoice-related processes with our invoicing portal. Our invoicing portal also greatly benefits your team as it automatically handles all invoicing correspondence with clients, thus, significantly reducing the workload while ensuring better customer relationships. To support this, FinancesOnline highlighted PayorCRM for providing top-class Accounts Receivable Software best practices. The invoicing portal also benefits clients with lesser steps need to make a payment, and according to FinancesOnline, this can surely increase the rates of on-time transactions. The cherry on the top is the Rising Star award given to us by FinancesOnline. Their experts honored PayorCRM with this award after they recorded our increasing popularity on the market. This award is also given to software solutions that are seen as a reliable tool by clients. Try PayorCRM today to start receiving payments at a faster rate.